I have to be honest. My family doesn't share this recipe with just anyone. But we're friends, right? So, once again I am sharing the recipe for my family's pumpkin pie -- the best and easiest recipe in the world. I blogged about baking at my grandmother's house last year about this time. 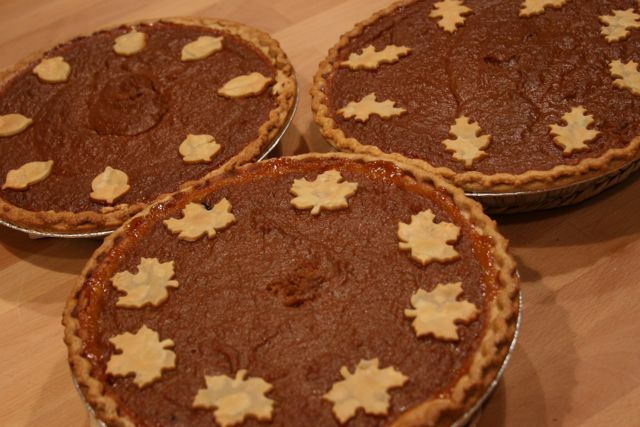 This was one of the first recipes I learned to make, and I make pumpkin pie all fall and winter. It is heavenly comfort food! Stir the ingredients together in the order listed and heat on the stove a bit (until it starts to thicken). Pour into a pie crust and bake at 400* for 15 min. Then cool the oven down to 350* and bake for 30 minutes -- until a knife inserted comes out clean. Cooking time totally depends on your oven and the depth of your pie pan. The real test is always the knife. I always make an extra crust, too. I have a great little set of cookie cutters in leaf shapes that make for the prettiest trim on a pie. And I serve my pie with whipped cream, slightly sweetened. I'll be making several of them next week as we celebrate Thanksgiving with my husband's family. I hope your family enjoys the pies, too! What will you be whipping up for Thanksgiving next week? Note (11/18/09): Several people tweeted me and asked about "scalding" the milk. Here's what you do... pour the milk into a heavy-bottomed pan. Heat it on the stove until it is almost ready to boil. I usually remove it from the heat when small bubbles appear around the edge of the pan. Why do this? Well, you are really making a custard, and the whole thing comes together much more easily (and without lumps) when the ingredients are warm. However, don't boil the milk, and make sure you stir as you are adding the ingredients or you can end up with scrambled eggs and/or lumps in your pie. So, there you are... scalding! I <3 Pumpkin Pie & yours looks dee-lish! & those leaf cut outs on top are beautiful! Love the details! Happy Thanksgiving! Yum. We LOVE pumpkin pie at our house. I can't wait to try your recipe--thanks! that pie looks amazing. i can't even remember the last time i ate pumpkin pie, over 5 years ago for sure. I'm making Thanksgiving dinner plans (my first Thanksgiving in America!) so I've bookmarked the post. I'll let you know if I make it. I'm totally inspired. I have 2 cans of pumpkin in my pantry that are going to get used up next week. delicious! I used the large can of pumpkin...is this correct? ....I wound up with enough for two pies. For 1 1/3 C of milk...for 1/2C of that volume I used sweet condensed milk. It was pretty good.